You all know Will Ferrell. He's that comedian who likes to strip naked. And you all know Bear Grylls. He's that really cool guy who can drink urine. Now put them together into an hour-long program, and you get Men vs. Wild. Actually, the complete title is Will Ferrell and Bear Grylls are Men vs. Wild. For those of you unfamiliar with the show Man vs. Wild, it's the wilderness survival show on Discovery Channel, hosted by Bear Grylls, where he shows you survival techniques that you never even knew were possible. In this special episode, Bear Grylls shows us how to survive in Sweden's arctic tundra, this time with Hollywood comedian Will Ferrell tagging along. Now Will Ferrell may seem obnoxious in a lot (in fact, most) of his films, but he does know how to tone down for serious shows like this. I mean, he is still funny, but without upstaging the show's host. He just sits in the back seat and limits himself to a few side comments here and there. But believe me when I say that he grabs every possible opportunity to crack a joke. Good work, Mr. Ferrell. When I first heard about this, I thought that the show might turn out to be a spoof or a parody, but no. It surprisingly remained true to the essence of the show. Will Ferrell did not transform it into a laugh-out-loud riot. It was still the same Bear Grylls show, only with Will Ferrell in it, which made it cooler, more interesting, and more humorous. Will Ferrell apparently was not chosen at random for this special episode. As it turns out, this is part of his promotional campaign for his upcoming film Land of the Lost. Boo to his shameless plugging, but hooray for a great show. 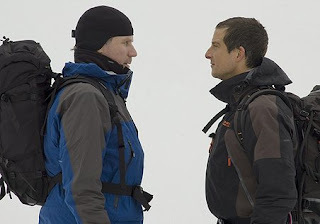 Will Ferrell and Bear Grylls are Men vs. Wild. Discovery Channel. 2009. Will Ferrell's subdued humor: Eight and a half out of ten. Bear Grylls' survival techniques: Nine out of ten. totally thought it was a spoof! thx for your review. And ever since we became Plurk friends...you commented less and less.